Golden Windows . . . . The sun shines on a beautiful summer afternoon. We sit at a small café table, across from one another, leaning in and sharing lunch. 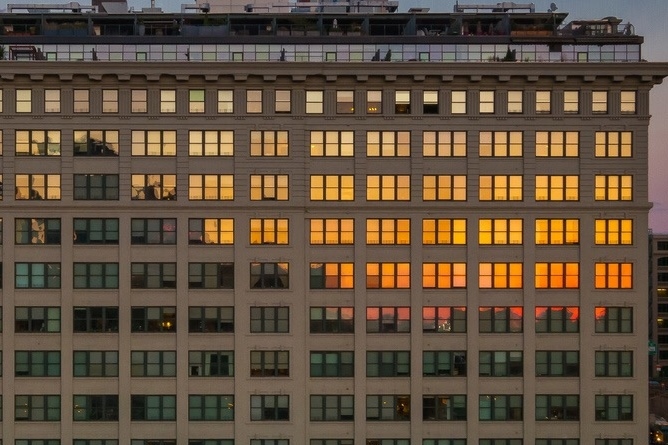 He shows me a picture on his phone, embedded in a text from his daughter, a photograph of what appears to be an office or warehouse building, the sunset reflecting in its windows. He says, looks like just a building, right? Look here. He points to two tiny words beneath the photograph, he reads them, Golden Windows. And then he tells me a story . . . this is how I remember it. When my girls were little, I would tell them the story of the Golden Windows. Do you know it? I shake my head no, and listen. A little boy lives in a village, in a modest home. His family is poor and he works long days laboring in his family’s fields. As he works all day, the boy looks to a village on a faraway hill. All of the homes in this village have golden windows. He dreams of living in the village, so rich the windows are gold. He imagines streets paved in gold. Every day, as he works, he looks to the hill, to the village and envies the people who live in their homes with golden windows. One day, the boy’s father tells him he may have the day off, the boy decides to journey to the village. He begins to walk at sunrise. He walks for hours until he finally arrives at the village, but he cannot find the homes with golden windows. Dirty streets and ordinary homes, surely he has lost his way. Discouraged and confused, he ventures home as the sun begins to set. Before he leaves, he sees a little girl and inquires about the wealthy village and the homes with golden windows. Perhaps she knows the way. Happy and excited she tells the boy to follow her. She points to a valley down below, her face beams. To his surprise, he sees a village, his village, and all of the homes with golden windows. I smile as his voice trails off, I love the story, the way he tells it, how he loves his girls and loves being a dad. But mostly I love him. He excuses himself for a moment, but not before quickly stealing a kiss. I sit alone with my thoughts, confused by the mixed messages of the last few months. He makes no attempt to see me. The time we spend together is initiated by only me. And yet, when we are together, he is attentive, tells me he loves me and is happy to have me back in his life. But somehow I know in my heart . . . I am not what he wants. I know it, but I cannot stop. In the weeks that follow, my doubt grows. I lose my appetite. I lose my nerve. I lose myself. I’m driving along the coast, I see an image. I stop to take a picture, but instead I send this text . . .
Days after the text is written, I tell him I need to talk to him, my heart is so, so heavy. We talk. He tells me he cannot imagine a life with me. I tell him I cannot imagine a life without him. So there we are, exactly where I believed we were all along. I wished we had stopped before we ever began, I really do. He says he loves me and we say goodbye. . . Through summer, fall, winter and now as spring approaches . . . golden windows have visited me more times than I can count. I want to ignore them, but I cannot untell a story that has been told. I cannot unlove someone I love. Instead, I find new meaning in this story, meaning that helps me move on . . . The golden windows remind me that all I am, all that I possess in my mind, body and spirit, is all I need. No traveling to the land of shiny new things, only to find it is not shiny at all. I know that now. The golden windows are here in my own home, in my own heart. This is my story to tell. A message from the ocean . . . Looking for a sign . . . I love to either start or end my day with one of your stories. You write so beautifully. Sometimes we just have to write out of faith that we will be reaching someone who needs a touch of beauty, kindness or peace at the moment. It is nice to see evidence that they are indeed reading tough. I do understand that. There has to be a beginning to get to the end. Sometimes the end comes short and sometimes it lasts a lifetime. No one knows. Love is a gamble. It’s a heart breaker. It’s a risk worth taking. The Golden Windows story reminds me a lot of the grass is always greener on the other side of the fence philosophy when in truth the grass is the same on both sides. Thanks for sharing your beautiful story! It was nice to meet you from the Blog Pitch Party! A story within a story, very powerful! Thanks for sharing. I found your blog on the blog party. This story is a gorgeous mixture of longing and love. Thank you for posting it. First up, thank you for sharing this beautiful story and your own story regarding it ( I know I’m going to re-read this often over the next few weeks).. I am so sorry for the pain you’ve been through and I deeply understand it. Also … thank you BNiP for wondering where I had gone.. that means a lot to me :o) Another blogger was very unkind and I guess it made me shut down – maybe what she wrote was true and made me snap out of my ‘re-blogging too many posts each day” as she put it … but I had lost my own words and re-blogging articles that were significant and meaningful to me was my way to work through a very rough patch, while I was very much alone. In some ways what she said was good as I am now focusing on the things I really need to focus on. … I also cannot unlove someone I love. Someone whose life now seems so much better than mine. But even through the heart ache (and sometimes depression, bitterness, stress and tears) I know I am ever so slowly making positive changes – I’m now putting myself out there, meeting new people – (I joined a group). I’m even creating a small business from home and putting my travel plans back for awhile. It’s an emotional and financial struggle but I’ll get there. The important things is to be gentle on myself and to keep moving forward even if it’s way slower than I ever imagined. So like you, I have to remember – “The golden windows are here in my own home, in my own heart”. I’ll be popping back to keep reading your blog – it always was my favorite. Silver Girl I am so happy to hear from you!!!!! I have missed you. I’m sorry that you were discouraged by another blogger. I love your blogs whether they are your original writing or reposts – I always find meaning in what you have to say and often share your quotes. Honestly when I read your comment tonight I cried. I’ve said often that my writing is therapeutic for me. First there is a huge sense of relief when I complete a story and then the feedback and the connections to other souls as a result? Well that is pure joy. I feel like I have a purpose in this world. I am so glad you are back. Blog, blog, blog!!! I’m glad that you reflected on what seemed to be a negative experience. I’m just sorry it kept you from doing something you love and do well. Thanks BNiP – you’re a honey and I very much value your writing. If I can find my words, I will write, but it’s almost like my heart has shut down. It’s all in there, but it’s too painful to access. Sometimes writing just pours out and seems easy and other times it’s just too much, too painful and remains stuck festering inside. I guess I don’t want to talk about it but I do need to release it.. Crying helps I guess. Taking my mind off things by keeping busy..
Maybe I need to start telling the people in my life how I really feel – the deeper stuff, not just the surface stuff. Now that’s really hard .. Reminds me of a quote.. Thank you so much for reading my story. I always appreciate receiving comments. I’m glad you could relate :-). Makes life better when we know we’re in this together. It was worth reading, I’m glad I did! Nice meeting you and look forward to reading more from you. Thanks so much for sharing this lovely story. For me the takeaway isn’t “be happy with what you have”. I think that you have to explore what else is out there, even at the risk of disappointment, to understand and appreciate your own life. Kudos to you for being an explorer, and I hope that you found actual gold as you moved on.